It’s been nearly two weeks since my last post. Other than when I first began blogging, I don’t think I’ve ever been quiet for quite so long. I do apologize to my loyal readers, but it’s taken me all this time just to feel “normal” again. The 2 Million Dogs Puppy Up! Walk was Sunday, November 7th and I can honestly say that I’ve never worked harder on anything in my life. I’ve organized events before, but never for charity and never with a crew of less than a dozen people. I’ve said it before and I’ll say it again: fundraising ain’t no place for sissies. You can quote me. One nice side-effect is that I’ve lost nearly 10 lbs. I call it the 501(c)3 diet and I wouldn’t recommend it to anyone. Eight-odd weeks ago, when I signed on to organize the inaugural 2 Million Dogs Puppy Up! Walk for Seattle, I was more than pessimistic. That’s my nature, but I was also being a realist. 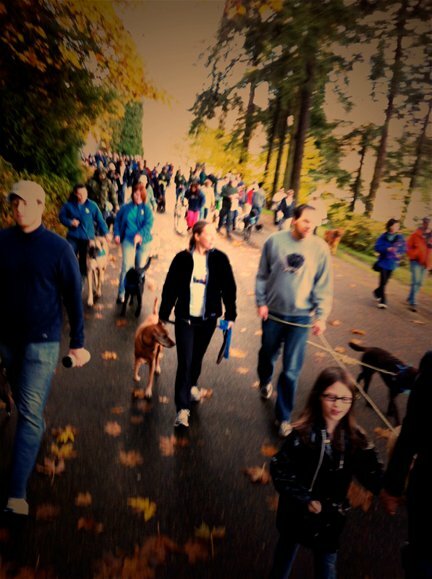 Seattle had just had two major fundraising events for dogs, the PAWS Walk and the Seattle Humane Society’s Walk for the Animals. Not to mention, our walk was going to be November 7th, and as anyone from the Pacific Northwest will tell you, November isn’t the best time to be outdoors in Seattle, unless you are a duck. However, what I hadn’t anticipated, was the passion that Luke Robinson’s cause had ignited in the people of Western Washington. The ugly truth of the matter is that far too many people have lost their beloved companions to cancer, or are currently facing the disease. Sure, we all love dogs and we will always support the walks that help the shelter dogs, but losing a dog to cancer cuts deep. The people that came to support Luke’s cause and walked with us on November 7th were there for those that they had lost. They carried pictures of their dogs, held leashes that once connected them to their boys and girls and carried the memory of that loss with them as they walked. It poured all day and all night on Saturday while we prepared for the event. But early Sunday morning, I woke to the sound of no rain, something that you immediately recognize here in Pacific Northwest. By the time our caravan of five vehicles headed out toward Seward Park, dawn was breaking and there were patches of blue in the sky. Incredibly, the sun came out and we had not a drop of rain fall on our Walk. While the official final count has yet to come in, it’s looking like Seattle’s Puppy Up! Walk managed to raise over $22,ooo, which puts us ahead of the 12 cities that participated this first year. So while I might be very tired still, I’m incredibly proud of what I managed to pull off, and incredibly proud of my fellow Seattleites for their support. Thank you all, and we’ll see you next year. If you would like to host a Puppy Up! Walk in your city in 2011, please visit 2MillionDogs.org for information on how you can become a part of this great organization.